Let me introduce you to Chris Colby, the author of the book, “Home Brew Recipe Bible” (2016, Page Street Publishing). For many experienced brewers, you might know him as the former editor of BYO and WineMaker Magazine. For many new to the hobby, hopefully, you have found his website, beerandwinejournal.com which focuses on deep technical brewing topics. Chris lives here in Bastrop, Texas, which has become a beer desert since the Bastrop Brewhouse closed a few years ago. Beer desert = that point when the local grocery carries better beer than you can get on draft. It was at the Brewhouse that I met Chris for the first time, and we have since shared a lot of beer, mead, BBQ chicken, Mexican food, and wacky movies and wackier discussions. He is devoted to his wife, brewing, gardening, caring for his clowder herded by Robert Paulson (a rescue cat), and writing for a variety of blogs and magazines. Chris is a blend of Hunter Thompson, mixed with heaping spoonfuls of Angus Young and Cnut The Great, wrapped up with the charm of Vanna White’s evil doppelgänger. If you ever get a BJCP score sheet from him, expect the scores to be rounded to the nearest thousandth decimal… or in metric. Warning: This is NOT an unbiased review. Chris is a friend. Accidentalis is mentioned and many of the photos come from my garage brewery. I was provided a free, advanced copy of the book. If this offends you, please move along! I sat down with Chris at Live Oak Brewery in Austin to discuss the new book, and his approach to brewing. Imagine there is the din of taproom conversations, benches creaking, and the aromas from mashing out a hefeweizen. I drank a glass of Live Oak Pils, while Chris sipped an Oak-toberfest. It was freaking hot outside. The Home Brew Recipe Bible is not a “How to Brew” book. Why the focus on recipes? My publisher was looking for a home brewing recipe book. They had the idea and went looking for an author. I added a section in the beginning titled, “Making the Most of these Recipes”, that covers what I think are the really important issues. Everything from cleaning and sanitation to recognizing off flavors and aromas. Plus, I added either a technique or ingredient tip related to the recipe, a possible tweak to the recipe, or both to most of the recipes. The book doesn’t teach people how to brew, it just gives them some recipes to explore and points to avenues of improvement or new techniques to try. Brewers are passionately attached to their systems and processes, from small and simple to incredibly complicated. So, I tried to give the important details to brewing each batch (mash temps, volume of strike water, etc. ), without specifying which equipment or techniques to use (fly vs. batch sparging). I also give recommended yeast starter sizes, and an estimate of how much wort can be collected from the grains, assuming the brewer wants to fully sparge the grain bed. Your recipes start with extract brewing and include a few steeping and mini-mash steps. What are your thoughts on extract brewing in general? (Chris) Extract is a convenient way to approach brewing, and for most brewers it’s the starting point — but you can make amazing beer if you know how to use extract wisely. I think most of the bias against extract is unwarranted — you can make great beers with extract, but are limited in producing certain kinds of beers. Many of the faults of “extract beers” are the faults of new brewers, not the ingredient or extract procedures in general. Steeping malts and mini-mash techniques further expand opportunities. The biggest issue is the freshness of extract, either dry malt extract (DME), or liquid malt extract (LME). Freshness really matters, and I explain in the book how to evaluate freshness in malt extract. 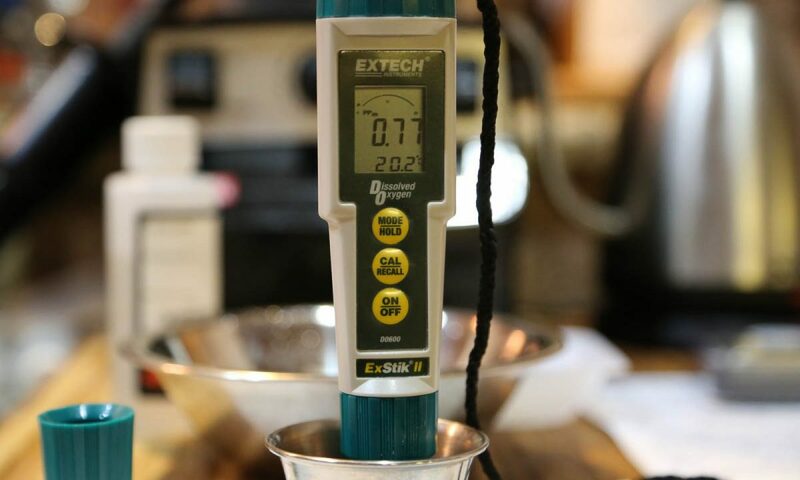 Another consideration is the fermentability of extract, but can be possibly addressed by steeping diastatic malts with the extracted wort to add some further conversion before the boil. Extract brewing with a mix of base grains and specialty “steeping” grains provides the most flexibility in terms of scale and complicated gear. Small batch brewers can easily brew on the stove top with just a simple kettle and bucket to ferment. The procedure for a small partial mash is no different from steeping with grains, with the exception that the window of temperatures and water-to-grain ratios are narrower. Even the most experienced all grain brewers occasionally use extract to hit gravity when their efficiency falls short. I used to brew exclusively all-grain, but now I know there are beers I make that turn out just as well with a partial mash formulation. As with most culinary recipe books, this is not a front to back reader, although there are clues along the way. How did you approach the recipe organization and format? (Chris) I grouped the beers loosely by type — dark ales, amber ales, etc. — and added the most relevant tip or tweak to each. So, brewers learn added information about their favorite beers first, followed by recipes they are less interested in. Brewers should know how to adapt a recipe to their particular system, including knowing their brewhouse efficiency and hop utilization, and have some ideas of how the recipe will turn out. This book is for the novice through advanced brewer, so it was important to include the usual information, but also expand that with notes on possible options or unique techniques. Novice brewers will get more from it, of course, but I think there are a few nuggets in there that will make it worthwhile for advanced brewers. It is important to look at recipe creation and brew the best beer possible with the flavors that the brewer prefers. Although I encourage novice brewers to follow the recipes and procedures as closely as possible, I hope (and know) that intermediate and advanced brewers will take these as a starting point and brew whatever the hell they want to. And I think that’s great. Each recipe features the name and the style of the beer, grouped into logical sections; dark ales, amber, pale and hoppy, dark and malty, lagers, and sections that focus on specialty yeast and bacteria, and finally specialty and unusual ingredients. I tried to give the beers interesting names, instead of “porter #34” as it would appear in my lab notebook. A brewer can search the section that most interests them, find a beer that sounds interesting and quickly get into the details. All of the recipes are standardized on 5 gallon batches, 70% extract efficiency, a Tinseth-like hop utilization curve, and provide the general statistics that have become the standard for home brewing recipes. Comments on the styles are at the top, with clues to the how the recipe was designed, style considerations, and what the brewer should expect. I describe the brewing procedure in a general way. Acceptable variations on yeast selection or hops selections are included, as well as suggested mashing temperatures and techniques. Where possible, I include the malt extract equivalence, often with steeping grains. If the recipe introduces an advanced option, such as cereal mashes or dry hopping, these are covered. Most of the recipes have a “Recipe Options and Notes” aside section, blocked in yellow, to cover important key issues with the recipe, such as hop styles or other approaches to recipe development. They are there to inspire and encourage experimentation. I leave the choices open in terms of malt providers. Brewers are going to buy what their local homebrew shop carries anyway. The malts in the recipes use general names, such as two-row, pale malt, or six-row, crystal or caramel malts are indicated by their color. In most cases, a preferred country of origin is given. A good brewer will use the freshest malt available and use premium malts when possible. There can be differences between maltsters in both base and specialty malts, and the brewer should taste and experiment with those malts to find the right specific choices. It seems that many of the sections build on knowledge, with tips in context of both the beer recipe, but also the general style. Does it make sense to read a whole section to gather the progression? (Chris) Yes, the tips in each section generally proceed from the most basic to the more advanced. The pale lager section, for example, mentions a variety of style components, touches on decoction, yeast pitching rates, and more advanced (and simple) options to make an incredible lager. The introduction to each group category also helps to cover many of the topical points, including mash chemistry recommendations. This book allows a brewer to approach the sections and recipes in a natural way. The brewer learns by doing, essentially, and I think that is a great way to learn. How is your personality expressed in this book? (Chris) This book includes many of my favorite recipes. There’s my pale ale and my porter — my two “go to” brews — along with other beers like my Cranberry Zinger or Weiner Blut (Vienna Lager). I like a lot of beer styles and I like to experiment with ingredients, but also provide a rational approach to recipe creation. Some recipes allow you to go way out to an edge, others are just great examples of classic styles. My love of all things science, history, music, movies, and cats, also shows in many of the titles: Frost Giant Jule ØL, Beelzeboss, Dunkleosteus Dunkelweizen, and This Black Lager’s Name is Robert Paulson. Included are fun recipes from Mark Schoppe (2 time AHA Ninkasi winner), James Spencer (beerandwinejournal.com, Basic Brewing), Denny Conn (Experimental Brewing, Experimental Homebrewing and Homebrew All-Stars ), and Dan Ironside (theapthomebrewer.com, Idiot’s Guide: Homebrewing). So the book has that going for it. The book definitely should be read with a music playlist that includes Rush, AC/DC, The Replacements, and Black Sabbath . . . and a cat on your lap helps a lot! Why aren’t any of my recipes included? (Chris) This interview is over! Get off my lawn! All right, finish your beer. Hey you forgot to sign my book! The Home Brew Recipe Bible is a great resource for both novice and experienced home brewers, and much more than any old recipe edition or clone manual. The paperback format is crafted in such a way as to lay flat, the signatures are sewn, and the full color photos and details are beautiful. The organization of recipes is convenient and easy to flip through. The recipes, in general, are a fresh take on styles, without going too far off the rails. It is approachable, without the deep dives into science. Beerandwinejournal.com serves that need well, and gets very technical. There is a sense of whimsy and direction that doesn’t coddle or talk down; authority without kindergarten tonality. This is a great book for home brewers looking to expand their repertoire of recipes and gain experience brewing new styles, AND have the confidence to brew with some wacky or unusual ingredients. We learn best through exploration — and there is a lot here to help refine our techniques and build new brewing skills. At least Honey, my lovely squirrel hunter, likes my beer, despite her skeptical gaze. Good interview! I learned something about hop utilization. I don’t have many home brew recipe books but this one looks great. The cover alone makes me want to buy it! Sounds like a good read. Once I work through my backlog of brewing books over the winter, I’ll have to check it out.